Hey friends! I’m back today with a new layout using the Boughs of Holly Cut File. This cut file is one of four free cut file sets that are available on The Cut Shoppe Blog. I started in Cricut Design Space by slicing out the portion of the cut file that I was wanting to use. I then resized the image to 11.5″ because I wanted the cut file to be a large focal point on the layout. I wanted to print my photos in a star shape to continue on with the star theme. I used the Print Then Cut feature within Cricut Design Space to size and print my photos into the star shape. I cut the cut file image on the Pines Patterned Paper from the Pinkfresh Studio December Days Collection. I positioned the cut file image towards the top of my background patterned paper from Hip Kit Club. Before adhering the cut file I added white gesso to the background and added color, Shimmerz Paints-Great Fruit Creameez, to the background using the packaging technique. While I waiting for the mixed media to dry, I cut multiple stars in white cardstock and vellum to use as layers behind my star shaped photos. After the mixed media was dry I adhered the cut file and photos. I then added hand stitching around the cut file with blue embroidery floss. Next I created a visual triangle of embellishment clusters using Pinkfresh Studio December Days Puffy Stickers and Die Cuts. Now you can take a look at my process video that also includes a Cricut Design Space tutorial! Thank you so much for spending part of your day with me! 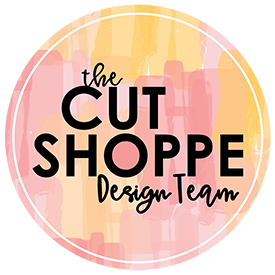 Remember to head to The Cut Shoppe Blog to download those freebie cut files and to visit The Cut Shoppe Etsy Store!